The United States added two more medals to their haul in PyeongChang, with Chloe Kim taking gold in the women's half pipe and Arielle Gold joining her on the podium for bronze. After four days of the Winter Games, the United States has six medals and sits sixth overall in the medal count. Norway continues the lead with 11 total medals. 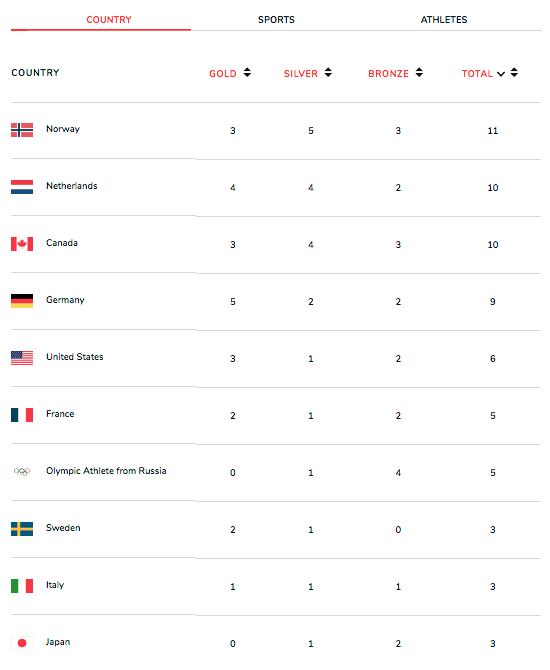 The Netherlands is tied with Canada for second with 10 medals each, respectively. The Dutch have won a majority of their medals from speed skating. Eight of the 12 medals that have been awarded have gone to the Netherlands, including all four gold medals. The feat was capped with world champion Kjeld Nuis winning the men's 1,500 meters just ahead of his teammate Patrick Roest. Sports Illustrated editor Richard Demak noted that with the Dutch gold in the 1,500 meters, all of the men's titles in the sport have been held by athletes from one country. The last time that happened was in 1980, when American Eric Heiden won gold in all five speedskating events. The United States remains without a speedskating medal in PyeongChanag after Joey Mantia, Brian Hansen and Shani Davis finished eighth, 15th and 19th respectively. One other notable medal from Day 4 was Marcel Hirscher of Austria finally winning his first Olympic gold. He is widely considered one of the greatest skiers of all-time with his nine world championship medals, but only had a silver medal from the 2014 Winter Games to show for his Olympic legacy. That all changed on Monday when he prevailed in men's combined, and he may not be done yet—Hirscher is favored for gold in the slalom and giant slalom as well.